Bay Street RFC is a 12 year old club, fielding competitive teams while maintaining a minimum training commitment. We are actively looking for players who have foreign experience, or those who have played rugby at university or club level in Canada, but have had to step away from the game to focus on their career, family or social lives. 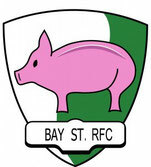 Bay Street RFC enables you to play competitive rugby and hoist pints with your fellow pigs, without interfering with ongoing professional commitments.